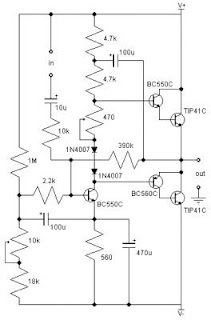 This design is based on the 18 Watt Audio Amplifier, and was developed mainly to satisfy the requests of correspondents unable to locate the TLE2141C chip. It uses the widespread NE5532 Dual IC but, obviously, its power output will be comprised in the 9.5 – 11.5W range, as the supply rails cannot exceed ±18V. This is an instrument amplifier for monitoring music when on stage. It provides 21W output power of this little design. Previously I had a decent 10W amplifier (RED Free Circuits), but we blew that one somehow. Now I will put this into the old box. I haven’t built it yet, but the simulations say it works as I designed. In this design, wiring is important due to no differential amplifier. I might need to add ripple rejection with a zener as in the above design.